You've boosted your brainpower with Train Your Brain. Now get ready to increase those skills with Train Your Brain More! Like the body, the brain needs exercise. 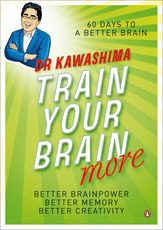 And Dr. Ryuta Kawashima, world-renowned professor of neuroscience at Tohoku University and the expert behind the bestselling computer game Dr. Kawashima's Brain Training, has dedicated his life to researching exactly how we can make our brains work better. Follow his advanced programme of carefully chosen, yet deceptively simple activities. Each day you fill in a worksheet of easy exercises and with weekly self-tests and a personal logbook you can track your progress. Taking just a few minutes a day over two months, you really can boost your brainpower and creativity, and change your life. Join the Dr. Kawashima revolution today.